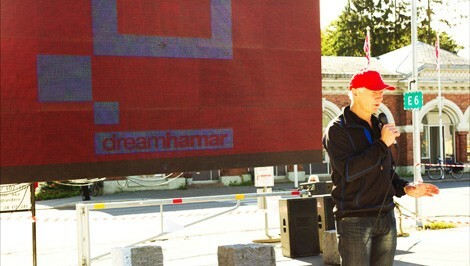 Last Saturday dreamhamar was officially launched in Hamar. Officially that is, as the project has been already running for already 3 months. Ladies and gentlemen, welcome to dreamhamar! 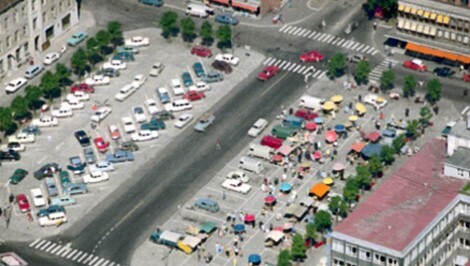 For the past 50 years, the main square of Hamar, Stortorget, has been a parking lot. Alread busy one in the 60’s, as you can see in this picture. This is how things were, until now. 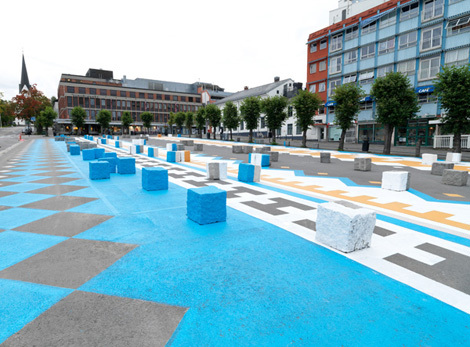 The time has come to say good bye to engines and honks in Stortorget Square. 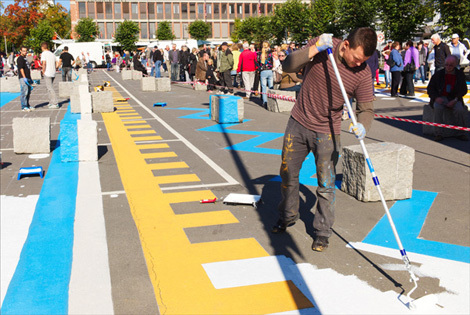 In December 2013, the construction of the new Stortorget Square will be finished and the square will become public space again. Like back on the day, it will be a public square made of people – rather than cars -, made of the sounds of laughter and distant conversations. As you may already know, ecosistema urbano is the chosen architecture and urban design firm that will lead the redesigning process of the new square. 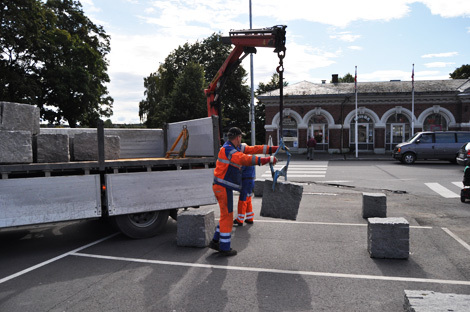 We decided we didn’t want to wait until to 2013 to enjoy a public space in Hamar, since the city needed it and we needed an outdoor working space for the upcoming workshops where every citizen of Hamar will be able to shape the future of the square. So we set a date: Saturday 17th, September 2011. 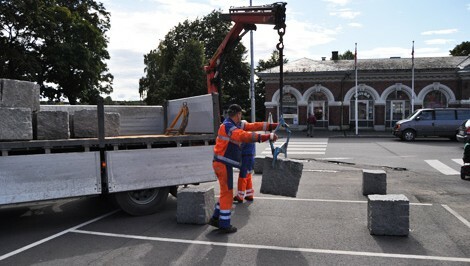 Stortorget 2011. Frank and the bollards. Be careful with your feet! 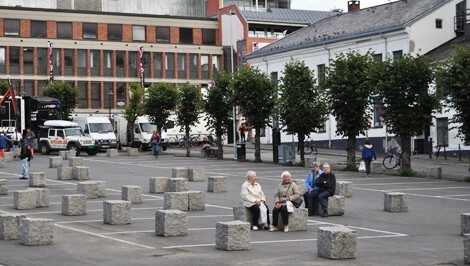 To celebrate this new beginning for Stortorget, we managed to close the parking lot by simply moving and changing the use of the existing granite bollards, from being the limit of the parking lot, to benches and tables for this temporary public space. As you can see in the picture, we have Frank and his team to thank for this space. It was a simple, but impressive, transformation. A little sunshine is enough to draw people to the square. Now the stone cubes are places to rest, have an ice-cream, jump or talk. Boamistura working on the painting design. What will they come up with? Stortorget was still grey and uninviting. 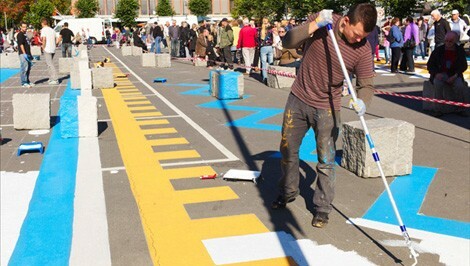 So we called Boa Mistura, an urban art collective from Madrid, to re-interpret the temporary public space. 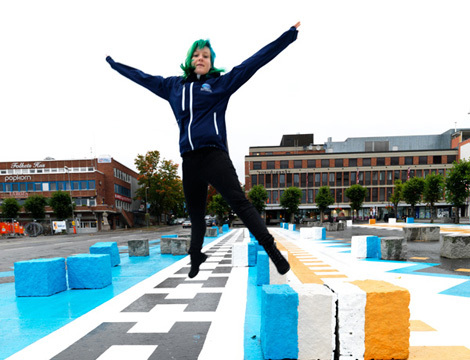 It took 3 days, 52 hours of work, 120 litters of paints and 10 hands, to transform the space in a cheerful, colorful, stage for creativity and innovation. Hurry up, guys! The weatherman forecasted rain! 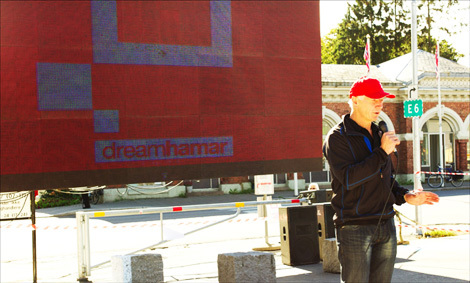 Starting at 14h, the city of Hamar gathered at Stortorget for the opening event of dreamhamar. 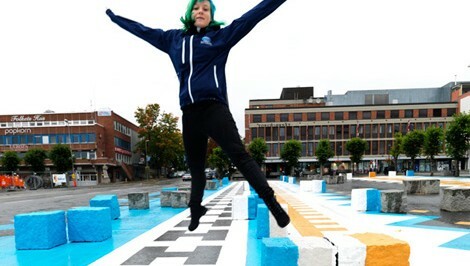 At the beginning, no one dared to walk over the new paint, but little by little the space filled with people. Gry Veronica Engli, a lovely energetic woman who supported the project since the competition phase, presented dreamhamar and invited everyone to participate. 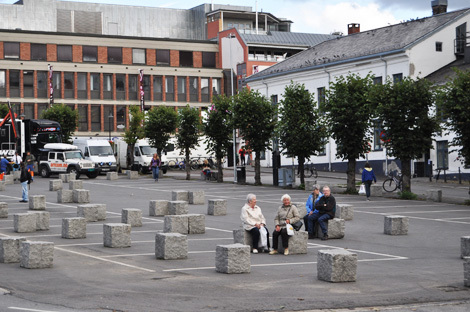 Then, the acknowledgements: We thank to Eidvisa Breadbånd, who provides FREE wi-fi to the square! Hamar sentrum who helped us with communication and sound system, MEDIA 1 who supported us with the printing and graphic design, the viking ship for letting us the LED screen and folkehøgskole for letting us use their sound system. Right after, there was a serie of speeches starting the Mayor, Einar Busterud, and ending with the invited guests. The mayor of Hamar, Einar Busterud. There were many other speeches (we are planning on publishing them too). 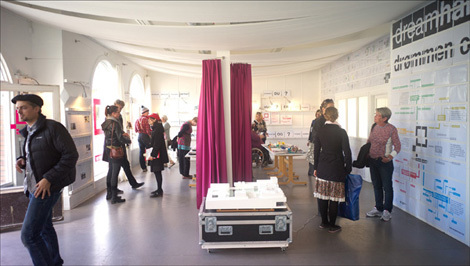 When they were over, Gry invited everyone to visit the dreamhamar office in the basar building – the physical LAB, which was quickly filled with people who were looking at the interactive model, registering for the workshops, reading information about the project. Overall, it was a great sucess as over 60 names were registered! The Physical LAB. You are invited to come and visit us! 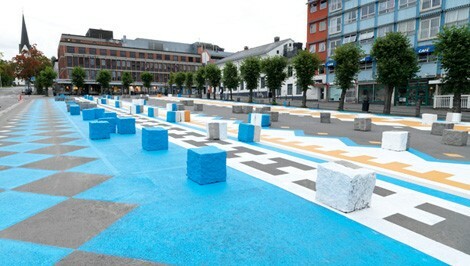 This is how Stortorget looked after the artistic intervention of Boamistura. It makes you wanna jump, doesn’t it? It is amazing what some paint and lots of imagination can do. Get used to experimenting with Stortorget! It has potential! Those who stayed outside, watched the video introducing the different collaborators of the project. I will leave you with them. As you can see, dreamhamar is in good hands! We are glad to report you that Ecosistema Urbano’s principals Belinda Tato and José Luis Vallejo visited Hamar last week to present the ONETHOUSANDSQUARE project to the city’s politicians. Work on the project has not yet begun and another article was published in the local newspaper, supporting it in the name of democracy – “Invitasjon til demokrati” (invitation to democracy) was last week’s title in Hamar Dagblad, a local newspaper. “I think the Spanish project is exciting, especially because it invites us to participate in a democratic process’ says Brox Haugen (..) Today the square is large, sloping, gray and noisy. We, the local residents, must find out, preferably together, how we can make it more inviting.’”. While preparing the URBACT Biannual report, we came upon an interesting innovative educational tool – ATLAS OF DIVERSITY. Composed of a network of schools, the ATLAS uses mutual collaboration to generate one of the most important and world extensive database on cultural diversity.